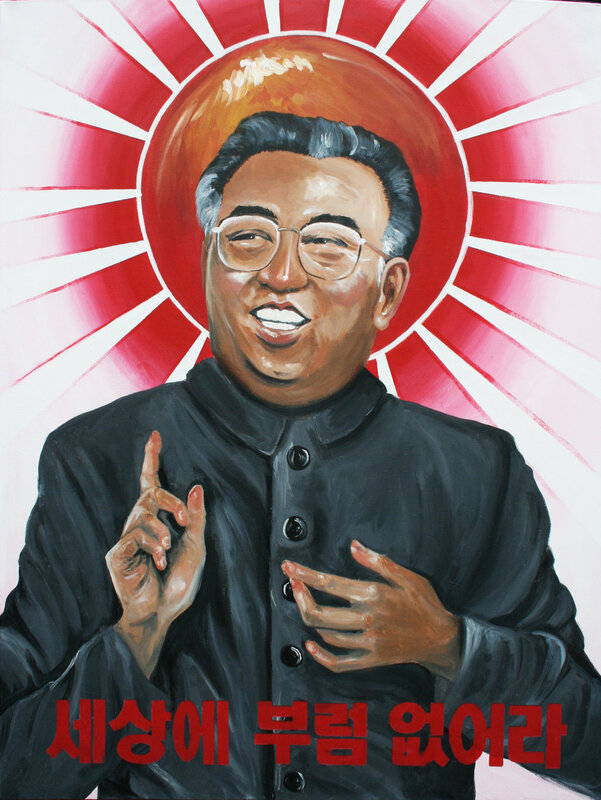 Few realize that Korea was once the most Christian region in Asia, particularly Pyongyang. In fact, Kim Il Sung's own father was a Protestant deacon. After the division of the Korean peninsula, Kim Il Sung began a mass purge of Christians and suppressed all forms of religion, including Buddhism and traditional folk beliefs. Several hundred former religions structures survived these purges and the Korean War, but they played an ever-diminishing role in the lives of the people. Today, only token "churches" and "temples" exist in the country, and a few Buddhist sites that are scattered around are left open as tourist spots. Just outside of the urban core of the coastal city of Wonsan exists a curious remnant of the former religious life of the northern Korean people. Although monks, nuns, and their associated religious buildings existed in the area since the 1920s, the Territorial Abbey of Tokwon wasn't established until 1940. It only managed to service the surrounding counties until 1949, as that's when things began to drastically change. 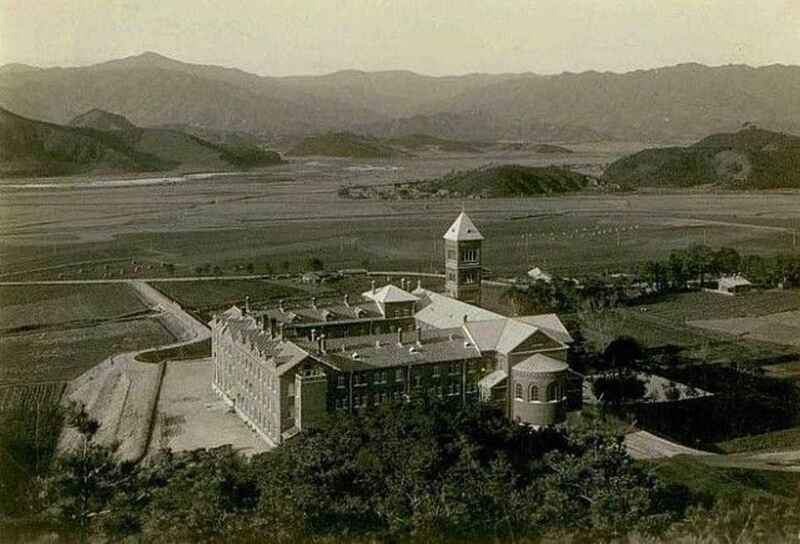 In May 1949, North Korean secret police arrested the Abbey's 80 or so Catholic personnel (which included foreigners as well) and over the next several years 35 of them had died from execution, hard labor, and starvation. Among those who died was the Benedictine Abbot-Bishop Boniface Sauer, who died on February 1, 1950. In 1952 the remaining German monks and sisters were deported. Wonsan University of Agriculture. Google Earth, Nov. 3, 2017. The Abbey building itself suffered bombing damage during the Korean War, but it was later converted to secular use. It now sits on the campus of the Wonsan University of Agriculture. Some of the survivors established a new monastery in South Korea, and that monastery is the technical administrator of Tokwon - however no one is allowed to visit Tokwon and no religious services are held there. Despite the events of history and the reality on the ground, Tokwon is still one of the few official territorial abbeys of the Catholic Church, and the only one in Asia. Tokwon Abbey building. Google Earth, Nov. 3, 2017. Abbot-Bishop Boniface Sauer and the other Tokwon martyrs are now among over 100 North Korean Catholics who are under consideration for beatification. One of the major accomplishments of the monks and nuns of Tokwon was the translation of the New Testament epistles and the Book of Revelation into Korean. 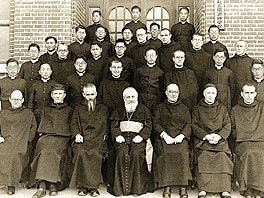 Abbot-Bishop Boniface Sauer (bottom row, center) and the brothers of Tokwon. Image date unknown. Christianity (all denominations) went from one of the largest faiths in North Korea, with over 1.7 million adherents prior to the Korean War, to as few as 11,000 mostly older followers. The only official Christian organization in the country is the Korean Christian Federation, which claims some 10,000 members. While the North Korean Constitution guarantees freedom of religion, it also bans any activities that may detract from the power of the state, organizations that could be tools of imperialism, and other related prohibitions. Under these vague terms, the state can suppress any religion it desires. Indeed, Christians in North Korea are considered the most oppressed religious group in the world and countless thousands have been murdered by the regime in concentration camps. The newly completed Abbey. Original date and source unknown. When Korea was divided, access to countless human stories and historical sites vanished from the face of the earth. We can use satellite images, defector testimony, and the ever-shrinking pool of living memory to help reconstruct the past, but the true story of the millions who have survived, endured, or died over the course of the past 70 years will only ever been known when North Korea is finally opened to the world.